Photo courtesy of Rick Edelman/Rick Edelman Photography Mercer Island senior midfielder Kendall Riley controls the ball against the Lake Washington Kangaroos. Riley scored a goal on a penalty kick in the 79th minute of play. Mercer Island defeated Lake Washington 5-1. Photo courtesy of Rick Edelman/Rick Edelman Photography Mercer Island senior midfielder Kendall Riley controls the ball against the Lake Washington Kangaroos. Riley scored a goal on a penalty kick in the 79th minute of play. 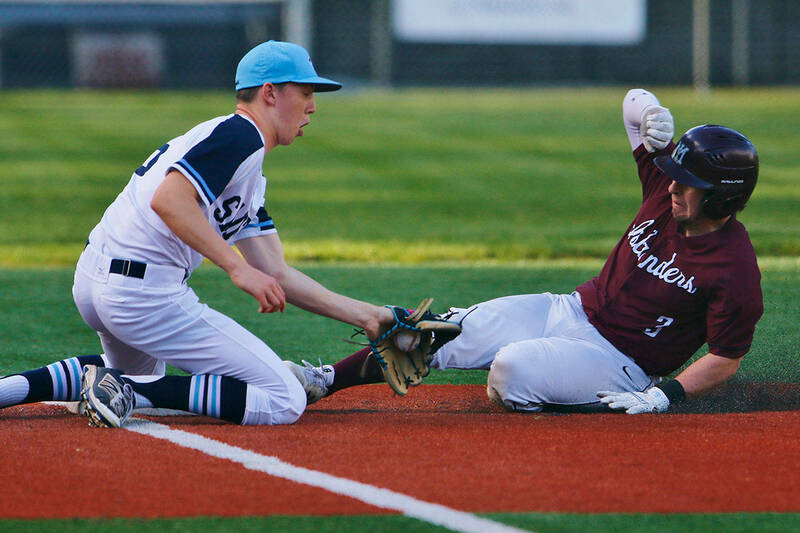 Mercer Island defeated Lake Washington 5-1. The Mercer Island girls soccer team couldn’t wait to get back on the field after suffering their first loss of the 2017 season. The Islanders, who lost 2-1 to the Redmond Mustangs on Sept. 28, got back into the win column just five days later, courtesy of a convincing 5-1 victory against the Lake Washington Kangaroos on Oct. 3 at Mercer Island High School. Mercer Island improved their overall record to 7-1 while Lake Washington dropped to 6-3 overall. Mercer Island junior forward Nicole Mandt scored a team high two goals (45th minute, 60th minute) in the win. Mandt’s goal in the 45th minute was a spectacular run that consisted of making multiple Kangaroos players miss before uncorking a shot, which found the back of the net. The Islanders leading scorer of the game was thrilled to see her team rebound after its setback last week against the Mustangs. Mercer Island players Elaina Martin (26th minute), Jackie Gilroy (78th minute) and Kendall Riley (79th minute) each scored a goal apiece in the win. Mercer Island first-year head coach James Valles wasn’t surprised his team dominated against Lake Washington.